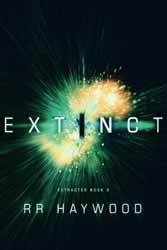 Extinct: Extracted Book 3 (2018. 407 pages) is the third in this time travel action series written by R. R. Haywood. I have not read the first two books in the series so at times the story left me somewhat bemused and it wasn’t even the time travel elements which I felt were handled well. The author had not seen fit to add in a synopsis of what had already come to pass, which would have helped. Not that it turned out to be vital. Much of the information is finally revealed to the reader, so we discover what happened at Cavendish Manor, but not till quite far into the book, this leaves a lot of the context of the story missing for much of the book. The biggest failure of this type relates to Miri. All through the book a character called Maggie Sanderson is referenced. The one person who Mother hates and who she views as a terrorist. She blames her for the attack and consequent loss of life at Cavendish Manor and her own public humiliation. This is the largest part of Mother's motivation in changing history to draw her out. The only problem is that the character does not appear in the book. As the leader of Miri’s party, you try and rationalise what might have happened to her, dead? Missing? Who knows. Literally, it is only within the last few pages of the book that Haywood point out to new readers that Maggie is Miri. Really, because that missing point of information confused the hell out of me. So that’s the gripes aside. Overall, I really enjoyed the book, there is a good deal of humour as well as action and some dark passages, especially those set in Berlin, during a bombing raid. Hayward skillfully turns the tone of the book to cover all these elements without them feeling forced. This time around the team continue to try and save history, mostly by interfering with it. Arrayed against them is Mother and her team of crack agents. The interesting thing about the book is that Haywood doesn’t really take sides. Mother is deranged, or at least deliberately offers up that interpretation. As Miri and her team are viewed as terrorists, Mother feels justified going to any lengths to capture them, but at what point does your personal view of yourself as the good guy come into contention with your actual actions. From a simple change in Roman Britain, Mother escalates her incursions hoping to capture Miri. The time travel elements are handled well, even if the twist it easy to see coming. The end of the book leaves so much open that I resume that another will be on its way soon.